Tacko Fall is a 7'6" engineering major currently averaging a double-double for UCF. Khadim Sy and Sidy Djitte are both starters for two of the ACC's most improved programs, Virginia Tech and Clemson respectively. Christ Koumadje and Abdoulaye Gueye are two young bigs for Florida State and Georgia Tech who look poised to break out as upperclassmen. Over the the past several years, there has been an influx of players hailing from Senegal, an African coastal nation of 13.5 million inhabitants. The five listed above are some of the country's most recognizable names in college basketball. Besides their nationality, what do they all have in common? All five are alumni of Dakar's Flying Star Academy, a program with an impressive pedigree despite its anonymity. Ibrahima N'Diaye, Flying Star's founder and operator, had a clear vision when he created the program back in 2011, though it didn't involve high-major college basketball at all. "In the beginning, I did not try to get them to the states or Europe," he said. "It was mostly [about] trying to keep them occupied, after school when they don't have things to do." Teaching the younger generation the importance of education was another motivating factor, N'Diaye said. "When [kids] come to us, we try to promote education and let them know that, okay, sport is good, sport is much better than sitting with your computer and doing bad stuff in the street...but you have to make [room for] both basketball and education. Not only sport." According to N'Diaye, this is one of the main issues faced by youth in Senegal - many stop going to school because of their involvement in sports. "They spend so much time on the playground, on the basketball court, so they [begin to] fail," he said. N'Diaye's understanding of the relationship between basketball and academics is underscored by his personal experience. His brother Mamadou parlayed his basketball talent into a full scholarship at Auburn and upon graduation, he became the first Senegalese native ever drafted by an NBA team. Mamadou's legacy looms large over Flying Star. "I saw [it] in my own family," N'Diaye said. "Mamadou, he was helped by his coach, who offered him a scholarship and helped him go to school in the states. I saw how basketball helped Mamadou get [that] scholarship, so I use that to try and help kids find scholarships." N'Diaye understands how complicated the journey from Flying Star to the U.S. can be. "Sometimes you take a chance, you give an opportunity to a kid, but when they get [to the United States], you don't know what will come from that...fortunately, most of the kids who get there are doing really, really well in school." The pride N'Diaye feels in his players academic acomplishments is palpable. When discussing Tacko Fall, arguably Flying Star's most famous alumnus, N'Diaye is just as eager to spotlight Fall's mastery of the English language as he is his on-court prowess. Flying Star's impact isn't just reserved for men's basketball. N'Diaye is passionate about using the game to encourage women's empowerment. Per a 2009 UNESCO report, for every 100 Senegalese young men attending secondary school, there are only 79 young women enrolled alongside them. N'Diaye is doing his part to counteract this imbalance through his work at Flying Star. In fact, the academy's youngest age group consists of more girls than boys. "I have sisters who have education," N'Diaye said. "We [in my family] have an open-minded way of life, that boys and girls are the same. You have to give them the same opportunity. And this is why I try to give the same opportunities to boys and girls." Currently, three Flying Star alumnae are on Division I rosters: Fifi Ndour of UCF, Anne Francoise Diouf of Georgia Tech, and Temple's Lena Niang. "It's a blessing," N'Diaye said while reflecting on Flying Star's overall impact. "Maybe some of our kids will never get a scholarship to go to the states, maybe they will never be professionals, but...it gives them hope. They take to school and basketball instead of going out and doing bad stuff." Meanwhile, on Florida's Space Coast, two of Flying Star's former players are poised to become the program's next ambassadors on the collegiate level. Mbacke Diong, a senior, and Lahat Thioune, a junior, ventured from Senegal to Melbourne's Florida Prep this past August. One might say that a burgeoning pipeline is coming to fruition between the two programs. "Mbacke and Lahat are the third and fourth young men from Senegal to have come to Florida Prep who had orginally attended Flying Star Academy," said Joe Burley, Florida Prep's Athletic Director. "We had a young man about two years ago named Abdou Diaw, who joined us for his senior year. Abdou graduated here in 2015, and as he was graduating, he had mentioned to us that a friend of his was considering...potentially coming to Florida Prep. At that point, Abdou introduced us to Ibrahima N'Diaye, who basically got us in contact with the young man, Ndiaga Diop, and Ndiaga came in last year to our program. Through Ndiaga and Ibrahima visting our school, they discussed the possibility of bringing a couple other young men who had interest in coming to the states and playing." Diong and Thioune are both 17 years old, making Diong quite young for his class. The two have only been playing basketball for four years, picking up the game together at Flying Star. However, Burley is quick to point out both the natural gifts each player possesses and the strides both have made since their enrollment at Florida Prep. "They both have benefited greatly from time in the weight room, because they didn't have much experience or exposure to a weight room," Burley said. "In terms of their games, both of them needed work on their post moves, but Mbacke's strength is his ability to guard four positions. He's one of the best overall athletes on our team. He's fast, he's got terrific lateral movement, so defensively he stands out for his ability really to guard anywhere out on the floor." As for Thioune, Burley says that "[H]e is a little more traditional as a rim protector, but he is very much what schools and people are looking for in a big man. He's a pick-and-pop big man, he can face up and hit the three-point shot and he's worked a good bit on his post moves. It's been great to see [his] confidence build as a junior over the course of the year." Adding the pair to Florida Prep's roster has played a significant role in the team's success. They hold a 19-5 overall record, 14-0 in district play. "[Diong]'s rebounding and shot-blocking is elite at a high school level," Burley said. "His presence has been significant in improving our defense because it allows our wing defense to step out and guard the floor knowing that he's behind us [with] wing protection. [Diong and Thioune] basically take a lot of pressure off of our [small] backcourt. We've had a good year, we've had some wins, but their presence inside has made us an elite defensive team." Burley notes that Diong's rebounding and shot-blocking should "transfer very easily to Division I basketball next year." 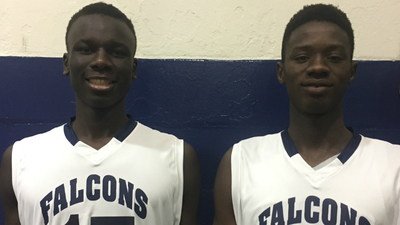 Diong and Thioune's impact on Florida Prep can also be felt on the offensive end. According to Burley, "[Our offense] was very perimeter-driven, but the majority of what we've shifted to are high-low sets to get both of them involved. [Diong] is an excellent passer, and as I said, with [Thioune]'s ability to face up, pick-and-pop and knock down some shots, they're a very strong combination offensively." The young men cite the Minnesota Timberwolves' Gorgui Dieng, the most prominent native of Senegal in the NBA, as one of the players they look up to the most. Following in his initial footsteps as a high-major college basketball player is not far off at all for the duo. Both have garnered scholarship offers from Pittsburgh, UNLV, and Louisville (Rick Pitino was in to see the pair this week). Diong picked up a UConn offer back in December and has recently been offered by DePaul and Memphis. Diong and Thioune are open to the idea of playing together at the collegiate level. "We played at the same time at Flying Star and here [at Florida Prep], so we know each other," Diong said. "I know what he can do and he knows what I can do." Both added that while teaming up for a third go-round would be nice, the situation would have to be the right fit for each of them. They are not set in stone as a package deal. With the spring signing period just over two months away, Diong is beginning to weigh his options. While he currently does not have any visits scheduled, he told Verbal Commits that each of the coaches who have offered scholarships are interested in bringing him up to their campuses. Diong and his family are currently in the process of doing research and mulling over which schools to visit, with an eye on beginning that stage of his recruitment soon. Burley's final words on Diong and Thioune are a telling indicator of where they both came from. "You know, one thing that has really impressed us with the kids from Flying Star, particularly with Mbacke and Lahat, is the extent to which they're true students," Burley said. "What tends to be lost in the recruiting process until we chat with some of the coaches...[Mbacke] just turned 17, he started school young. He's an exceptional student. As talented as he is on the floor, he's shown us the same skillset if not better in the classroom. Lahat as well has just turned 17 and is an extremely hard-working student. We take pride at Florida Prep in terms of talking about our student-athletes. Both young men truly live up to that in the classroom as much as they do on the court." No matter where Mbacke Diong and Lahat Thioune end up, they will give Ibrahima N'Diaye and Flying Star Academy two more reasons to be very proud.